Only a small amount of breeds are suitable for this program and only a handful will be able to successfully complete the program. The up bringing of a trainee is very important for success. Suitable dogs are those who are problem solvers, intelligent, real cool temperament, love to work, and love to work with human type dogs. Best breeds are the German Shepherd Dog and Labrador . Training begins earliest at the age of 24 months. All previous training and upbringing must be carried out as a preparation period. A successful trainee will be the eyes of a blind person. The trainee will protect and guide whether at home or outside, open doors and windows, bring requested objects… Training is performed via 3 stages. Preparation, Training, Extra Requirements. 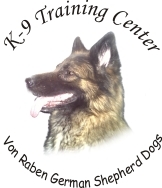 After trainee successfully completes the preparation period the trainee will continue with the training period and if successful will be a Blind Leader Dog. 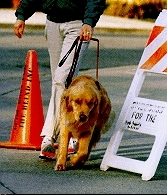 After developing ties with blind owner the trainee will continue with the last level of training. Here the owner will have decided on what is missing and what is required for them. Here the trainee will be trained for their owners personal requirements to be enable to be successfully helpful and to be a true guide dog for them not just a certificate owner standing up to the standards. Training will vary for trainee to trainee and requirements.